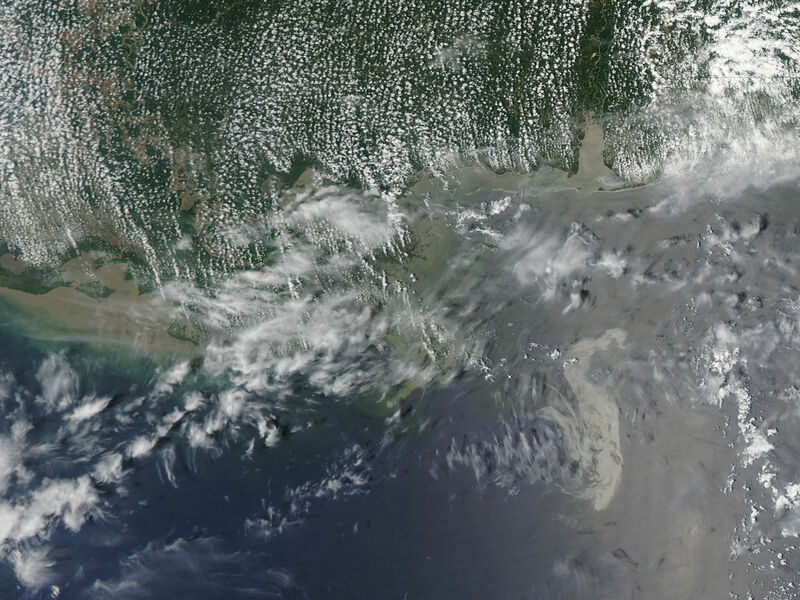 An image from the MODIS on NASA’s Aqua satellite on Tuesday afternoon, May 11, shows that the damaged Deepwater Horizon oil well continued to leak significant amounts of oil in the Gulf of Mexico. Oil slicks become most visible in photo-like satellite images when they appear in a swath of the image called the sunglint region—where the mirror-like reflection of the Sun is blurred by ocean waves into a washed-out strip of brightness. In these cases, the difference between the oil-smoothed water and rougher surface of the clean water is enhanced. The slick appears as a silvery-gray patch in the center of the image. The tip of the Mississippi Delta is at upper left. Wispy clouds make it hard to determine whether any of the streamers or smaller patches of oil extend northeast of the main slick. This entry was posted on 18 Mai 2010 a 21:55	and is filed under 1. Ciència, 4. Popular. You can follow any responses to this entry through the RSS 2.0 feed. You can leave a response, o trackback from your own site.